I love coming across something new - especially books! and was excited to be sent Derek Landy's Skulduggery Pleasant, Kingdom of the Wicked. This is obviously for children older than my little ones, however at 33, I have to say, I'm still a big fan of all things magic, mystical, fantasy, and make-believe - I'd rather be reading about vampires, ghosts, wizards, knights, murders and mysteries than about mushy chick lit or various shades of monotone. I'm not sure if its just a sign of my age but I did feel that some of the content - such as actual murders was a little advanced for adolescent readers but then I remember, at this age it was all about Point Horror for me! - and now I'm a parent, murder is one of the things on that list to keep my kids sheltered from for as long as possible! I think this winter, I'd quite like to catch a little bit of magic rather than the usual cold! The Skulduggery Pleasant series is hilarious, smart, action packed and full of extraordinary characters – a riotous blend of brilliant storytelling and comic book excitement, it’s perfect reading for kids who are bored of the same old heroes. Children of 9 and up from all over the world have discovered the awesome thrills and humour of the skeleton detective and his teenage sidekick as they battle to save the world. 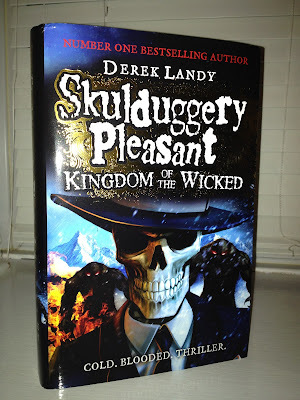 To celebrate the launch of the latest book (Kingdom of the Wicked) I have the whole series of Skulduggery Pleasant consisting of seven books to be won by one of my lucky readers! One reader will win one set of 7 Skulduggery Pleasant books, sent out directly from the lovely PR lady. Winners selected using random.org, please reply with your details with 7days of winning or another winner will be selected. Comp closes at 12noon on Wednesday 26th September! Skulduggery Pleasant The End Of The World (World Book Day Short Story). Dark Days, great comp thanks, my daughter loves these books.